Tesla's fleet of vehicles just keeps growing. At the announcement for the Tesla Semi, the truck with autonomous capabilities, Tesla CEO Elon Musk also announced a new Roadster. With Models S, 3, and X on the road, and Y on the way, you’d be forgiven for forgetting the original Roadster. Before Tesla had its own factories, before there was even a Tesla car on the road, Tesla made a deal with Lotus to use the chassis of the Elise, and fill it with electric innards. The Tesla Roadster started the rise of the electric car (or at least the cool electric car) at a time when electric cars seemed like a pipe-dream and now it's back, with record breaking capabilities under the hood. Musk has set his sights on the combustion engine, and the gauntlet has been well and truly thrown down. Here you'll find everything we know about the new Tesla Roadster so far. We'll be keeping this piece updated with new information as and when we get it, so keep checking back for all the latest. Tesla Roadster: What is it? 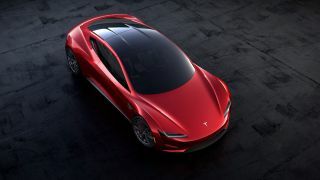 The new Tesla Roadster is an update of the car that started it all, the original Tesla Roadster. It's a convertible four seater sportscar with a glass roof that can be removed and put into the trunk. By Musk's own admission you wouldn't want to try and fit a big person in the back seats, but frankly, Michael Jordan isn't going to fit in the back of any sportscar on the market. It is an all-wheel drive vehicle, with three motors. One in the front, and two in the back. It's powered by a 200kWh battery. It was officially announced as a surprise at the end of the launch event for the Tesla Semi. Once the electric truck had been unveiled, the cargo crate at the back fell open dramatically, the lights cutting out, and the new Roadster roared out onto the stage. It then did some very dramatic acceleration to show off its capabilities, and quite hilariously managed to lose the cameras so for a good few seconds you couldn't see anything but asphalt on the livestream. Eventually, it found its place on the stage behind Elon Musk, and he started listing the frankly staggering numbers behind the new electric firecracker. These aren't world records for electric vehicles either, these are world records for all vehicles. Musk has said that these are the specs for the base model of the roadster too, and if it follows suit with the other Tesla vehicles, you'll be able to upgrade to higher specs for more cash. There is another record that the Roadster is setting too. With a range of 620 miles on a single charge, this will be the first electric vehicle capable of doing more than 1000km on one charge of a battery. The Tesla Roadster is going to be $200,000 (about £150,000, AU$265,000) for the base model. The fact that Musk is referring to it already as a base model means that there will almost definitely be a few different iterations at different price points. If you feel like parting with a little more cash to be the first to get your hands on the new Roadster, there is a Founders Series, limited to 1,000 units that cost $250,000. While significantly pricier that Tesla's last vehicle release, a $200,000 price tag really isn't that unreasonable for a sportscar with the kind of performance the new Roadster is capable of. At present we just have a year: 2020. Now given that the announcement came as a complete surprise, it's possible that the production is already partly underway, but seeing as we're at the end of 2017, it's only really two years away. Given that Tesla has been struggling to meet up to its goals for production of the Model 3, we're not holding our breath for a rapid production of the Roadster. But you never know, if the production bottleneck gets sorted for the 3, it could well mean all future Teslas have faster production schedules because of it. If you want to reserve a new Roadster, either in its base model, or in the Founders Series, you can do that over on the Tesla website.